Cooling water systems remove heat generated from a variety of industrial processes. There are three basic types of cooling water systems: once-through, open recirculating, and closed recirculating cooling water systems. This publication describes water treatment requirements for the most common systems, once-through and open recirculating. Learn about cycles of concentration and how they are employed in cooling water treatment. This course is intended for mechanical engineers and other design and construction professionals wanting an introduction to the technologies, equipment and operational practices for treatment of cooling tower water. This course will give mechanical engineers and others an introduction to water treatment practices for cooling towers. 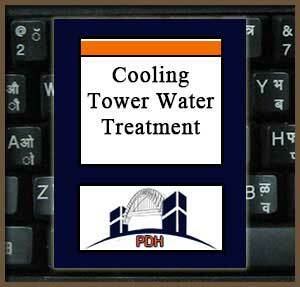 This is an introduction to best practices for cooling tower water treatment. This course will give you professional tools that will allow you to address water treatment issues associated with cooling towers in industrial applications.